Equality Illinois is condemning Republican nominee for governor Bruce Rauner and the Illinois Republican Party for attacking a rival candidate for supporting marriage equality and women’s rights. The campaign tactic was funded by Rauner despite his protestations that he has no social agenda, Crain’s Chicago Business reported Friday. 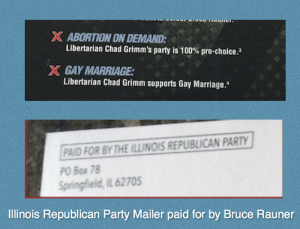 A flyer and robocalls put out by the Rauner-funded Illinois Republican Party attack Libertarian nominee for governor, Chad Grimm, who Republicans fear will siphon votes from Rauner and help Gov. Pat Quinn win re-election.